Recently, Foton AUV delivered 58 units BJ6105 electric buses to Qujng Public Transport Co., Ltd. for operation. Making their final preparations for official operation, these vehicles are set to greatly upgrade the city’s public transport system. With a more compact body structure, Foton AUV BJ6105 bus has improved its energy efficiency by 5% compared with its counterparts. By introducing light-weight materials for its body structure, the vehicle has successfully lost weight by over 5%. With fast- and slow-recharging mode available, the vehicle fully meets varied operation requirements. In addition, it has greatly improved its safety standards and thus provides more travel convenience and comforts for passengers. According to Foton AUV, it delivered its first batch of buses to Qujing in 2016. 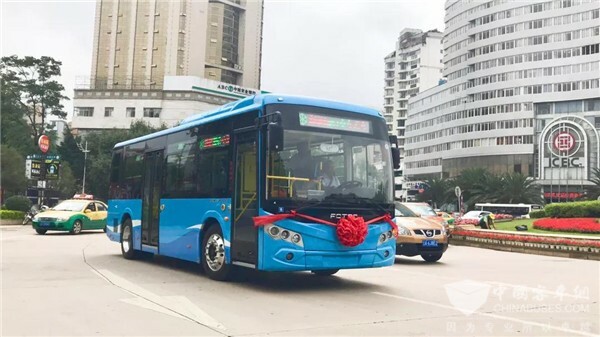 In August, 2018, 100 units Foton AUV new energy buses (including 21 units 8-meter electric buses, 49 units 10-meter gas-electric hybrid buses and 30 units 12-meter gas-electric hybrid buses) started operation in the city. Thanks to their eye-catching appearances, more travel amenities on board, higher maneuverability, higher environmental friendliness and higher reliability, these vehicles have long won the heart of the local passengers. According to Qujng Public Transport Co., Ltd., it will put a total number of 200 units Foton AUV new energy city buses on road this year, contributing its own efforts in the local government’s drive to save energy and reduce emissions.